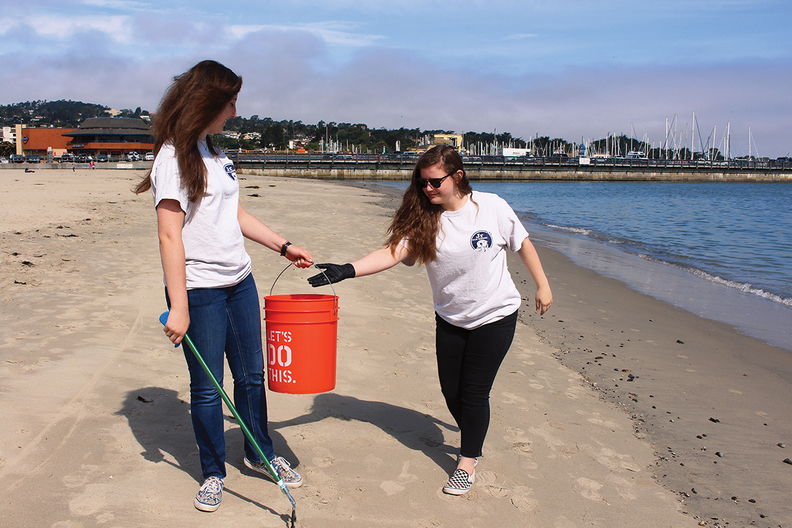 Shelby O'Neil, right, and a friend help clean up a beach in California. Dignity Health is eliminating plastic straws from its cafeterias thanks to a push from a 17-year-old ocean activist and Girl Scout. Shelby O'Neil, a high school junior from San Juan Bautista, Calif., contacted the health system's CEO, Lloyd Dean, last fall after seeing a Dignity commercial that featured a child blowing out the candles on a birthday cake with a plastic straw. "It's a super cute commercial, but straws are actually one of the main polluters," O'Neil said. According to conservation not-for-profit Lonely Whale's Strawless Oceans campaign, plastic straws can easily end up in the ocean, killing wildlife and polluting water. Although some plastic can be recycled, straws can be too small and lightweight to make it through mechanical recycling sorters, often ending up in the garbage anyway. O'Neil started her own not-for-profit, Junior Ocean Guardians, in 2017 for her Girl Scout Gold Award, the highest achievement for Girl Scouts. As part of the project, she has hosted beach cleanups and taught others about the dangers of single-use plastics, like straws. She chose straws because it's a relatively easy product to give up, and O'Neil said Dignity was grateful for her input. Within a month, Dignity put together a team to address the plastic stirrers and straws in their hospital cafeterias. According to Dignity, cafeteria straws make up half of all plastic straws the system uses, and the change will mean eliminating the use of around 4 million straws in a year. "Not a lot of people use straws in their house," O'Neil said. "So they don't really need one when they go out to eat."